The AirvO2, manufactured by Fisher-Paykel is a flow generator combined with a humidifier. It is capable of providing a modality called high flow oxygen therapy. When given with a nasal cannula appliance, it can produce a therapeutic benefit similar to CPAP in some patients. However, as a Registered Respiratory Therapist, what I am excited about is using it for delivering high humidity oxygen therapy to trach patients in long term care settings. Providing this type of therapy is no big deal in a hospital situation. There the respiratory therapist has both piped in oxygen and air. However, the usual lack of these gases in long term care presents significant challenges. One challenge is the set up. A 50 PSI air compressor needs to be set up in the patient’s room. If no supplemental oxygen is ordered, then the setup is not very complicated from this point. However, often the physician’s order specifies supplemental oxygen. So that the oxygen concentration can be determined, the output flowrate of the air compressor must be known. For this reason, an air flowmeter is required. A nebulizer or humidifier is next attached to the flowmeter. Usually a venturi type nebulizer is used, and the venturi mix setting should be at 60% oxygen. Since the nebulizer is actually being driven by room air (20.9% oxygen), and the entrainment of the venturi is drawing in room air, even though the setting is at 60% oxygen, the nebulizer is actually delivering 21% oxygen. The 60% setting is used simply to make the calculation of the total flowrate output of the nebulizer easy to determine. If the flowmeter is set to 15 LPM, the entrainment is adding an additional 15 LPM, so the total flowrate is 30 LPM. Attached to the output of the nebulizer should be an oxgygen enrichment adaptor. One end of the oxygen connecting tube is attached to this adaptor, and the other end to an oxygen concentrator. The concentrator flowrate should be set to a flowrate to yield the ordered oxygen concentration. For instance 1 LPM yields 23.5%, use 2 LPM for 25.9%, 3 LPM for 28.2%, 4 LPM for 30.3%, 5 LPM for 32.3%, and 10 LPM for 40.8%. Of course each of these percentages are dependent upon the air compressor flowrate being set at 15 LPM and the nebulizer mix valve being set at 60%, as well as the number of hours on the concentrator since the sieve beds were last changed which affects the output oxygen concentration. Part of the setup, but also part of another challenge is dealing with “rainout” in the aerosol tubing. Since there is likely a temperature drop along the length of the aerosol tubing before delivery to the trach tube, (especially with heated aerosol), you must deal with the condensate so it does not drain into the patient’s trach. Typically, a “Y” is placed in the delivery circuit. The “Y” contains a plastic bag to collect the condensate. This can all work nicely upon setup because the tubing can all be placed at just the right lengths so the condensate bag is at the lowest point in the circuit and all of the condensate will run into the bag. However, as the patient or bed is repositioned, the low spot can easily change. The next challenge is iatrogenic infection. The nebulizer is designed to produce an aerosol particle size that can bypass the upper airway and deliver water particles directly to the depths of the lung. This is great therapeutically unless the water particles include microbial passengers. In fact, it is difficult to put all of these pieces in the above described setup into place without inadvertently touching part of the patient circuit. Even if it is not touched, drawing room air through the nebulizer will contaminate the nebulizer. Water loving bacteria will double in number every 20 minutes, so within a day, the water in the nebulizer will be substantially contaminated. An additional challenge is the noise created by an air compressor, venturi nebulizer, and oxygen concentrator all running in the room as essential parts of the setup. Each of these challenges/problems are addressed by the AirvO2 high flow oxygen therapy unit. The risk of infection is reduced to near zero because instead of the output being water particles (aerosol), the output is water molecules. The water molecules cannot function as a transporter for microbes, so even if the water in the humidifier becomes contaminated, the contamination is not transported to the patient. Also, the way the parts to the setup are packaged, contamination risk is greatly reduced. The unit is quiet, solving the noise problem, and there are only four pieces to open and assemble, so setup is a breeze. The rainout issue is also solved by the use of a heated wire running down the length of the circuit hose with a temperature transducer at the distal end giving feedback to the humidifier heater. This feedback loop ensures the proper temperature of the heated humidity. 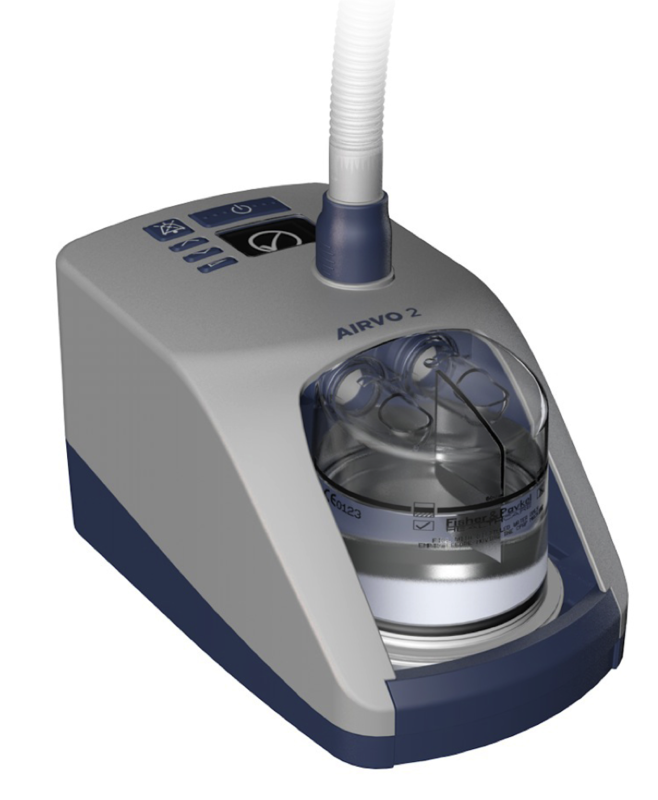 So, I highly recommend the AirvO2 system for any trach patient who needs supplemental humification, heated air, or supplemental oxygen. The Fisher-Paykel AirvO2 is a well-packaged high flow oxygen therapy device.